YOU GUYS. The Ducks play football THIS SATURDAY. And I don’t get to watch it. Life is cruel. Just to play with my heart a little, PAC-12 Network announced they’d be adding some games to YouTube for international viewers! Good news, right? Except that the only African country included was Senegal. Some games that are air on ESPN might be on a cable sports network here, but we don’t have cable. We’re hoping to go to a bar and beg them to play that channel on their TV, but that’s only a possibility if the game is aired during business hours. Oh, and our internet is far too slow to stream a live game. During a trip to the US Consulate a few months ago, I asked if they knew anywhere we could watch US college football in Cape Town. They laughed. Our only shot would be if we knew a marine and could watch it on the base. Which we definitely don’t. In other words, no football for us. My favorite season is usually fall. I love the weather, I love the food, and I love, love, love the football. Cape Town, your beaches better be extra spectacular the next few months or I’m going to be a total grump. Okay, enough of my whining. Most football seasons, I love having a few of our friends over to watch the game and cook up plenty of food. Here are a few of my favorite tools I keep in my kitchen for game days to feed hungry Duck fans (Other fans don’t get food. Sorry.). A dutch oven is perfect for deep-frying and what I use for hot wings, hushpuppies, and all of my other favorite deep-fried things. Right now I use an itty-bitty one I inherited from my mom, but I put a bigger one on my wedding registry. Make sure you have a candy thermometer, too, so you can keep the oil at the perfect 350 degrees for frying. A grill pan or cast iron skillet. This is my favorite thing to use for frying up burgers when it’s too rainy to use my actual grill. I love, love, love my cast iron skillet for searing steaks and making cornbread, too! My super sweet future mother-in-law got me that shiny gift. A football cake tin! Okay, this isn’t strictly necessary. But it’s really fun and I’ve made some very cool cakes with this thing. 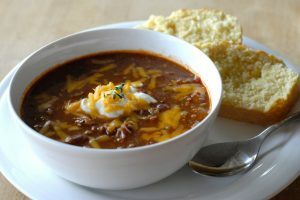 A slow cooker is great for getting chili going early and I even use my little tiny one for keeping dips or fondue warm. I love the programmable one my mom got me for Christmas a couple years ago! I get a lot of really awesome gifts from my mom and future mother-in-law. Future MIL also got me this gorgeous Rachael Ray bakeware set a couple of years ago. They make nachos so pretty and are great for baked dips! A hugely important staple to our game days is beer, especially since we’re in Portland, Oregon (usually) where great craft beer is abundant. We therefore of course have several Oregon Ducks pint glasses . Now that you’ve stocked your kitchen with the essentials, here are a few of my favorite game day recipes! Hot Wings make an appearance pretty much every game day. 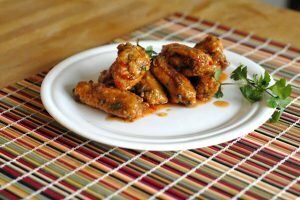 This is my secret recipe for the ultimate hot wing! If you want something a little different from the standard hot wing, I love these Blackberry Chipotle Hot Wings. They’re great to use up August and September blackberries! 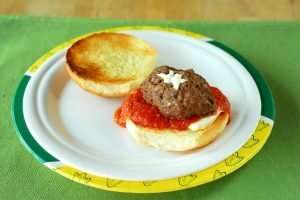 These Greek Meatballs with Feta Tzatziki are pretty easy- you can let people assemble their own sandwiches or you can just eat the meatballs dipped in the yummy sauce! Spicy chili and cornbread are fantastic for game days, especially during chillier November and December. My recipe for chili is plenty spicy and made with beer, of course! I almost always make my own hamburgers when we have them at home, and I think I’ve got the recipe perfected. This one has a bit of a twist: the patties have diced jalapenos and are stuffed with pepper jack cheese! A super easy way to feed a crowd is with a big dish of pasta. This Spicy Baked Pasta with Tomato Cream Sauce and lots of sausage is a great crowd pleaser! Have fun watching games this weekend! I hope you enjoy some great beer and even better food with them. 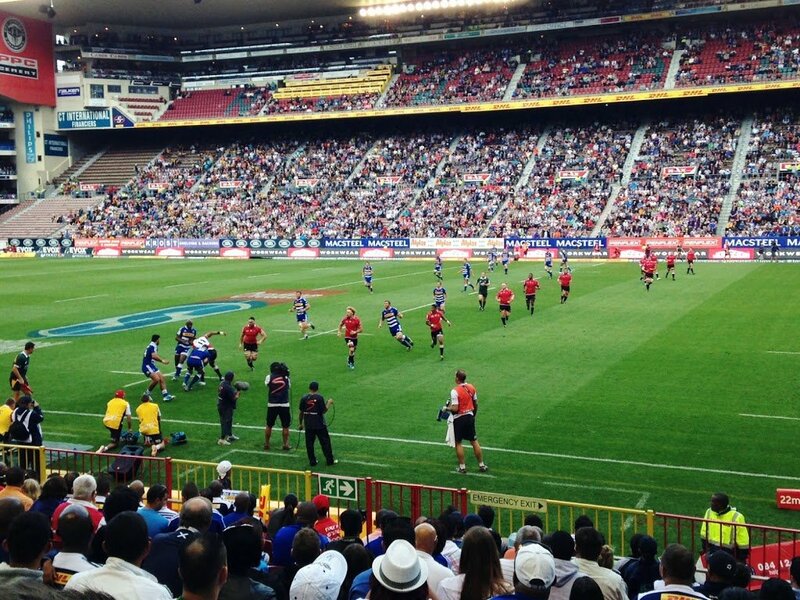 Two very popular sports here in South Africa that we don’t see a lot of in the United States are cricket and rugby. We went to our first ever cricket match a few weeks ago. It was a blast! We went to day three of a five day match. Yep, you read that right. Don’t worry, they break for food and sleep. 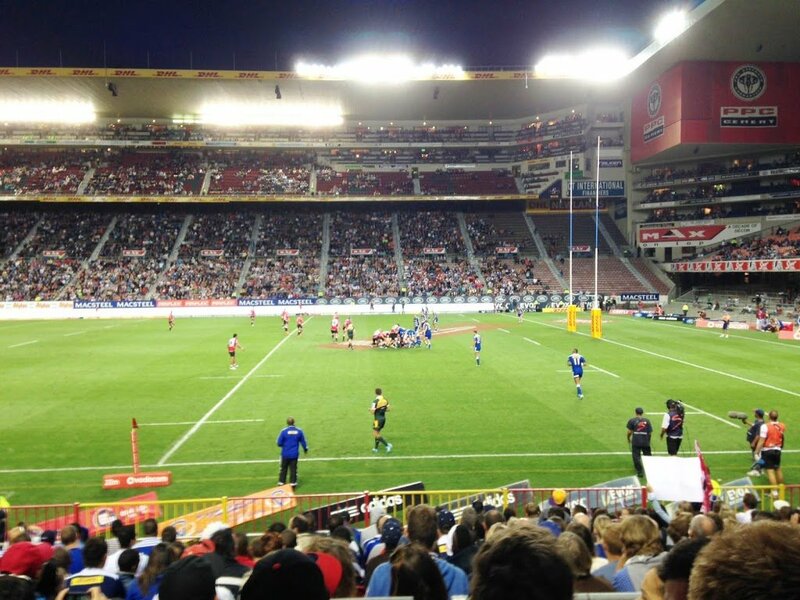 This past weekend, we decided it was time to attend our first rugby match! Rugby has elements of American football and soccer, which I love and watch frequently, but I still don’t at all understand this new game. They spend a lot of time buried on top of one another fighting over the ball and kicking it to the other end of the field. I’m not sure if I can get on board with this, but hey, I felt the same way about baseball at first. I need to watch more so I can get a better handle on this. Usually, going to games really helps me solidify my understanding of the sport, but we missed half of this game. Why you ask? We bought our tickets online the day before. We new it would be a popular game: it was Cape Town vs. Johannesburg. Unfortunately our only option for ticket collection was to pick it up at will call, but this wasn’t such a big deal, we’d done this at lots of past sporting events. We’d spent the day at a few different beaches (we saw wild baboons AND penguins in one day! AH! ), and got home about an hour before the match. On our drive home, we saw that the area surrounding the stadium was already packed full of people walking and trying to park, so we decided to walk instead of drive. It was only about a fifteen minute walk and we got there twenty minutes before the start of the game, er match. We wandered around for a few minutes looking for a “will call” or “ticket pickup” sign with no luck. Eventually we found ourselves in a gigantic line- it wrapped around a corner of the stadium. I verified with a couple of people working there (reality: I pestered every person in some sort of uniform) that this was indeed the line to pick up tickets, since there were no signs or any other indication this was where we should be. We thought we must have misread the start of the game- maybe the stadium opened at 5:05? But 5:05 rolled around, when we were about half way through the line of all lines, and they were announcing the players. Eventually, we were let into the base of a staircase which led up to a small office, where one person, on one computer, was printing off the tickets for each person who had purchased online individually. One single person was looking up and printing off tickets well over a thousand people, and they only started about a half hour before the game. This was some very poor planning on their part. My best guess is that they weren’t expecting this kind of turn out. Everyone around us was incredibly upset and when we got up to the office, a woman who I assume was a manager was getting chewed out by people livid that they’d missed half the game because they didn’t have the option to print their tickets at home. After working as a manager in a restaurant, I have a lot of sympathy for people getting yelled at who are the only ones who can be held responsible for an out of control situation. Watching that episode chilled my own temper and sense of injustice way down, and we were finally in our seats a few minutes before half time. It helped that this wasn’t a match we were invested in. I can’t imagine what that scene would have been like if it was a Ducks game. After that debacle, it was incredibly fun to be at a game that had the energy of a football game. I desperately miss going to Ducks games every weekend during the fall! Rugby had all of that passion and excitement, and I was into it. 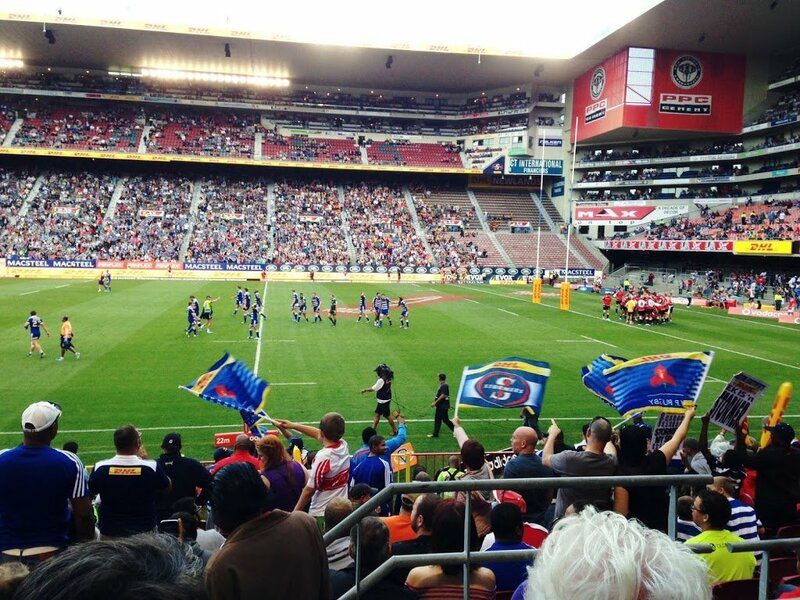 Even though I couldn’t quite track what was happening, the Cape Town Stormers were up by 15 points for most of the game, and that was enough for me. All the photos in this post were taken by Fiance. Thanks, Fiance! Football season is in full swing, everybody! Boyfriend and I went to the first conference game of the season, Oregon vs. Cal. It was really fun. I have truly never been outside in a storm like that- the announcers called it “monsoon weather”. At first it made the game even more fun and exciting. Cal literally could not hold on to the ball, so much so that their first three drives ended in fumbles recovered by the Ducks. This fired everyone up and put a bright spin on the dismal weather, but once we were up 27-0, the onslaught of giant raindrops being whipped at our faces by the stormy wind, it got really old. I’ve never left a game more than 2 minutes or so early, but I just couldn’t hang last night. We were safely up 41-0 a few minutes before half, and considering my poncho, raincoat, jeans, and boots were entirely soaked through, we decided to start the mile and a half long journey back to the car. It would have been fun to have the bragging rights of having stayed through that giant puddle of a game- only 5,000 of the originally 58,000 fans made it- but my health is thanking me today. Overall it was a very fun day, and I was so happy to be back in Autzen Stadium. We made stops at the 6th Street Grill, The Cooler, and the “Mo” (Moshofsky Center). My Ducks are ranked #2 in the country! I’m so excited for a fun season. Who are you rooting for? Don’t worry, you’ll only get spiteful responses from me if your response begins with Hus- and ends with a -kies… I root for the Beavs as long as they aren’t playing us! 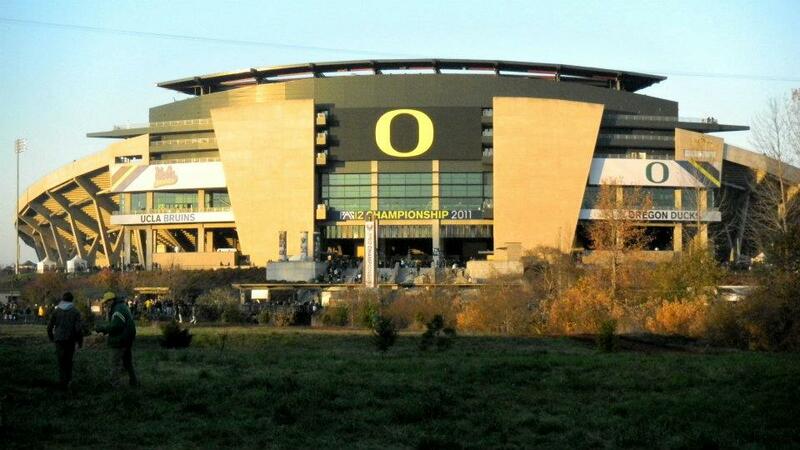 Oh, my beloved Autzen. How harmless you look in the bright light of day, in a moment when the sun is actually shining in Oregon. Some of my absolute favorite memories were made in this stadium, but it took me quite some time to figure out how to make myself comfortable and happy through the entirety of games. Don’t get me wrong- I have never left a game more than twenty seconds early and never, ever will- but it is nice to not have chattering teeth or a dry throat after screaming your lungs out. Before starting this, you should know that I’m morally obligated to say “It never rains in Autzen Stadium!” every time I start to mention it raining… in Autzen stadium- “It never rains in Autzen Stadium!” See? It’s a Don Essig thing. Go to a game and it experience it yourself, I beg of you. Scarves can totally be face warmers. Okay let’s start with the first layer. Well, not the very first layer… You know what I mean. I usually go for thick tights or leggings and a thick long sleeve t-shirt. 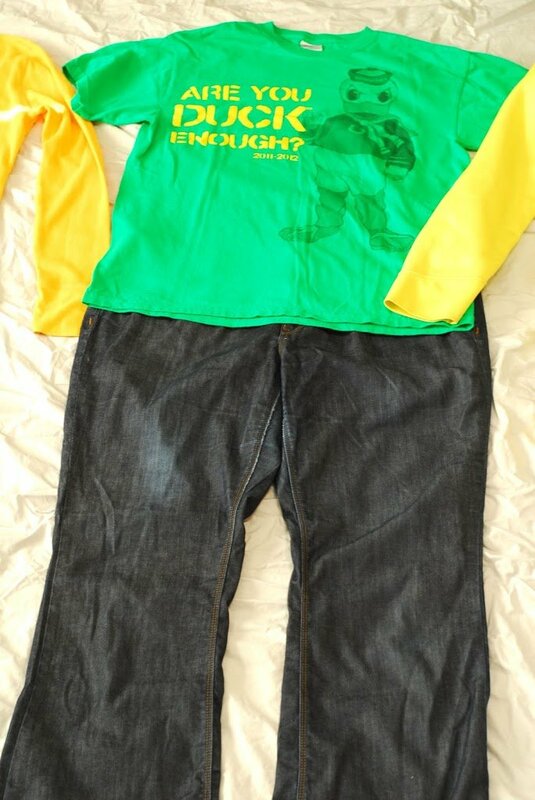 For the second layer, I throw a t-shirt over the long sleeve shirt and some jeans on. If it’s a really, really cold night, like unbearably cold, I’ll wear thick sweats over my jeans for a third layer. That’s usually not necessary, though. 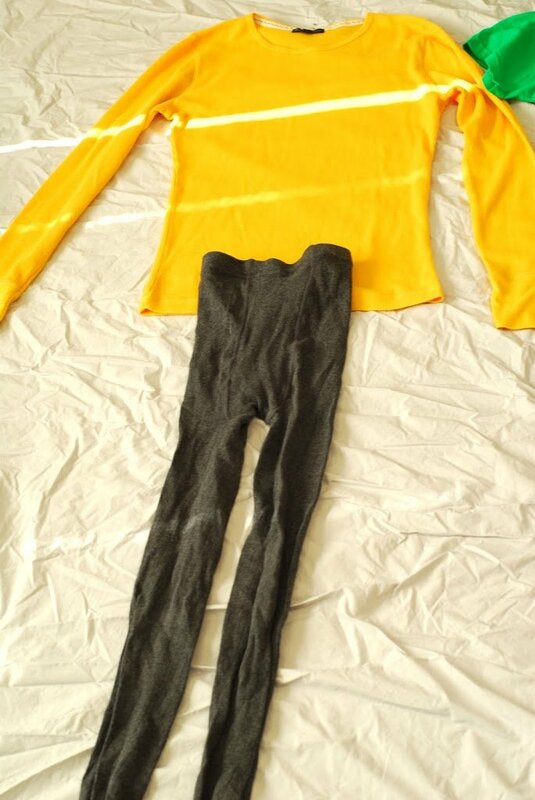 Last, but oh most certainly not least, on goes a sweatshirt, hat/headband, and gloves. And if it’s going to be a wet night- I mean… “It never rains in Autzen Stadium!”– of course my handy dandy rain coat comes along. 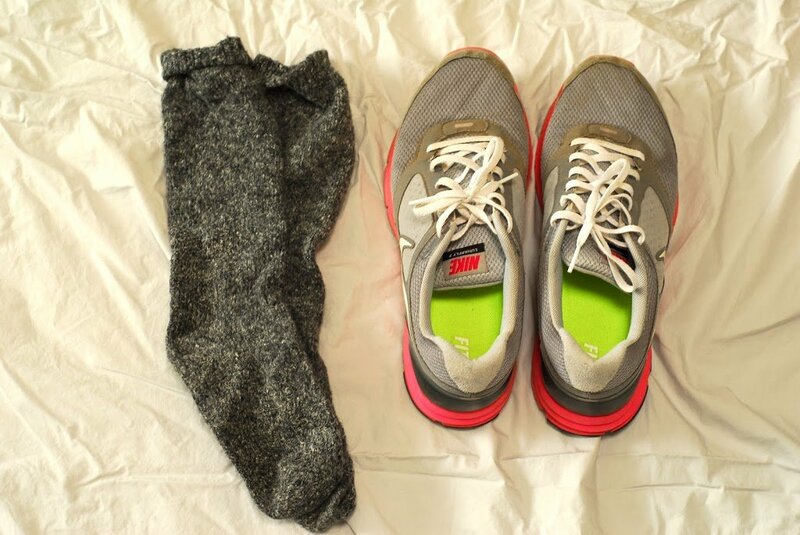 And make sure your feet are cozy and comfortable, too. Please wear comfortable shoes. You will be on your feet for hours. Hours. There is no sitting in the student section and there shouldn’t be in most other parts of the stadium. Since this is Eugene, Nikes are the most appropriate choice. Here’s what you’re going to take with you. You don’t need more, you don’t need less- you need exactly this. 1. 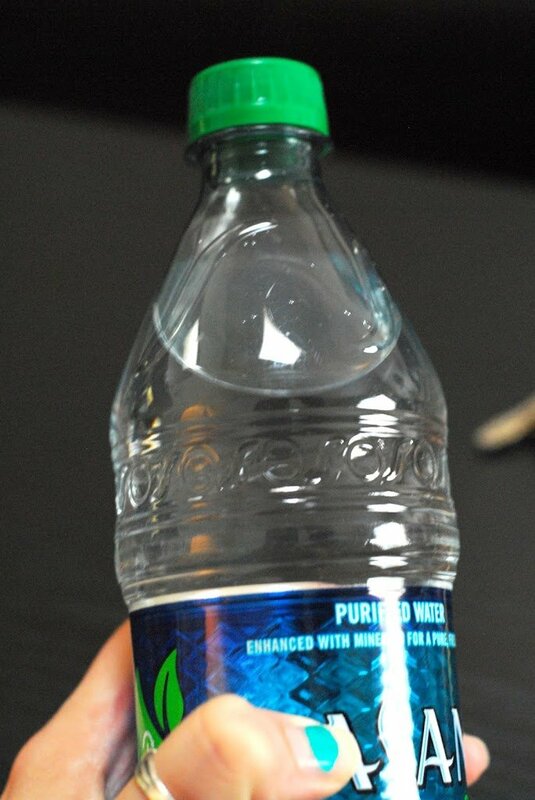 A sealed water bottle. Yes, I know that buying plastic water bottles in Eugene is practically a crime. But, if you try to bring your refillable water bottle into Autzen they will make you throw it out before entering the stadium. That’s right. For all security knows, your water bottle could be a jerry-rigged bomb. Or something. If you bring a sealed, clear water bottle, filled with clear liquid (that means no soda, juice, etc.) you’re good to go. I always get thirsty from screaming my brains out, so this is important for me. 2. Keys. Do I need to explain this one? Please don’t forget your keys. If you do, it’ll be a long night. 3. Chapstick. I’m a bit of a chapstick addict, so this comes with me everywhere. 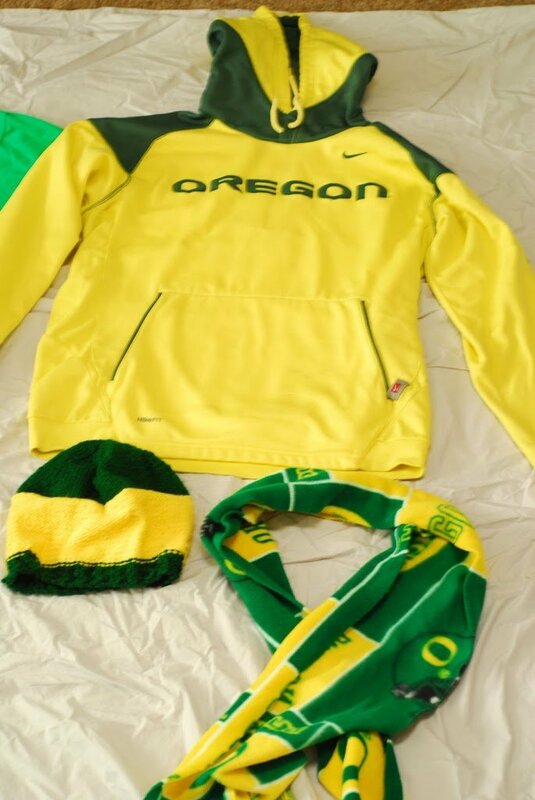 Even if you aren’t, it gets really cold for night games at Autzen and it’s nice to have on hand. 4. Your phone. You will definitely not get service in Autzen, so use it to find your friends before entering the stadium. It’s also nice to have for pitcha-takin’. 5. Little Hotties. These are only important if it’s a night game. 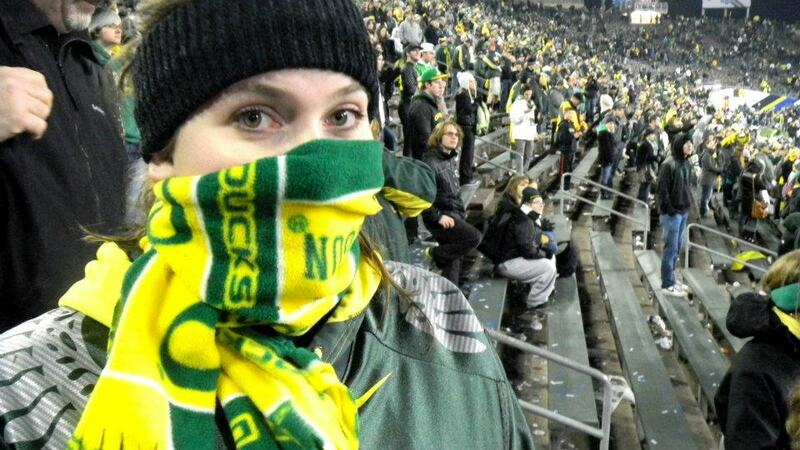 Again, night games get really, really, really cold and sometimes very wet- “It never rains in Autzen stadium!”– and Hotties have saved me more than once. 6. 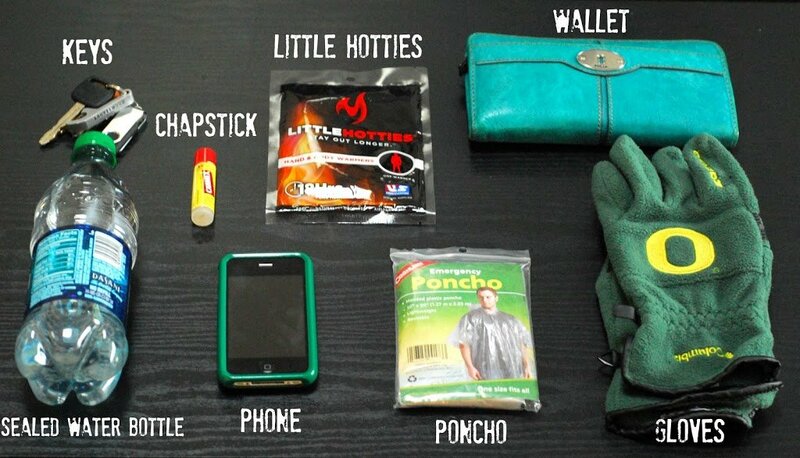 A poncho. 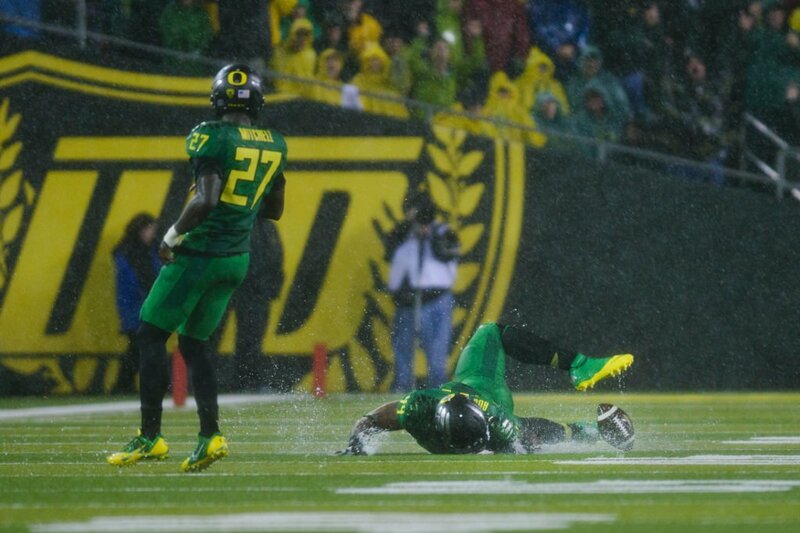 “It never rains in Autzen stadium!” But… bring one just in case. 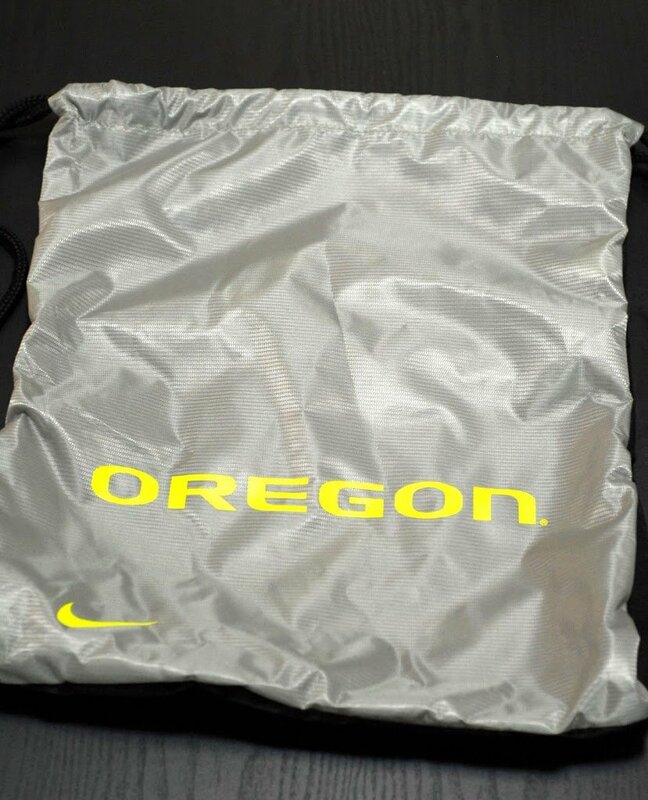 A rain jacket can only handle so much water, and since you’ll be standing out in the… moisture- “It never rains in Autzen stadium!”- for several hours, it’ll help you not get soaked to the bone. 7. Your wallet. Again, I don’t need to explain this right? You need your student ID to get into the game if you’re a student, your ID to prove you’re of drinking age before/after the game, and your debit card/cash to buy said drinks. 8. Gloves. It’s cold out. I’ve said that, right? So now that you’re dressed and well prepared, let’s make sure your bellies are happy, too. I like putting something in the crock pot before I leave so that I come home, quite tired and hungry, to something hot and ready to go. 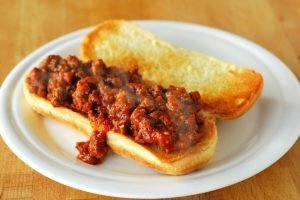 You could just stop by somewhere on your way back to campus/home, or you could have amazing sloppy joes waiting for you at home. Where dry clothes and a bed await. I hope this guide has helped you, and please oh please enjoy your Autzen experience! And of course, GO DUCKS! Football is back! Football is back! Football is back! The Oregon Ducks kick off tonight and so do many of our other beloved college football teams. We’re having hot wings tonight, including the blackberry chipotle wings I described in my last post. I can’t wait to share that recipe with you! In the mean time, here are several others of my tried and true football watching snacks. Have a blast today! Sweet hot chili wings. At the little wing party my family and I had, these may have been the crowd favorite. They somehow make the wings crispier and I love the sweetness. Football marinara. I had so much fun making this themed dish! Just like a meatball marinara, but cute. 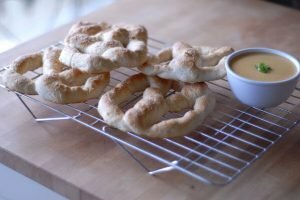 Pretzels with beer cheese sauce. Need I say more? Traditional hot wings. There are few things I love more than a really good hot wing with straight up buffalo sauce. 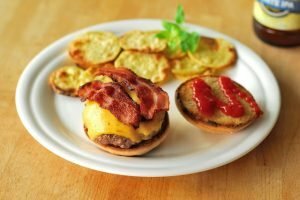 Burgers with homemade buns. There’s a reason burgers are the quintessential tailgate food- they’re versatile and absolutely delicious, especially with a homemade bun. 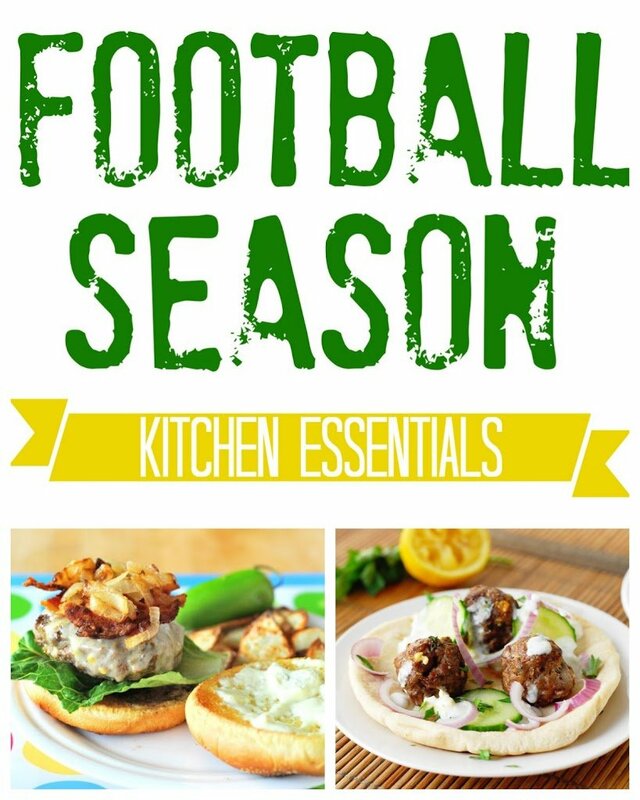 I hope you have a blast watching football, and happy cooking! GO DUCKS! Happy Holidays and Bowl Game Season! I hope you all had a wonderful holiday and are looking forward to the New Year! Friday night (the 23rd), we had almost all of my dad’s side of the family over which totals up to 35 people. Unfortunately, 11 of those 35, including myself and my brother, spent Christmas day in bed with a horrible, horrible stomach flu. I won’t give you the details. 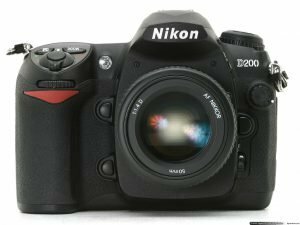 However, I was spry enough (I’ve been watching too much “Bad Santa”) to open gifts from my family Sunday morning, including a beautiful, incredible Nikon D200. It looks like this. I am still drooling over this beauty. I’m currently teaching myself all that there is to know about it (which is a lot!) and I’m planning on posting some fun things next week! It’s just so incredible. I think that I’ve used the word “incredible” a few too many times for one blog post. 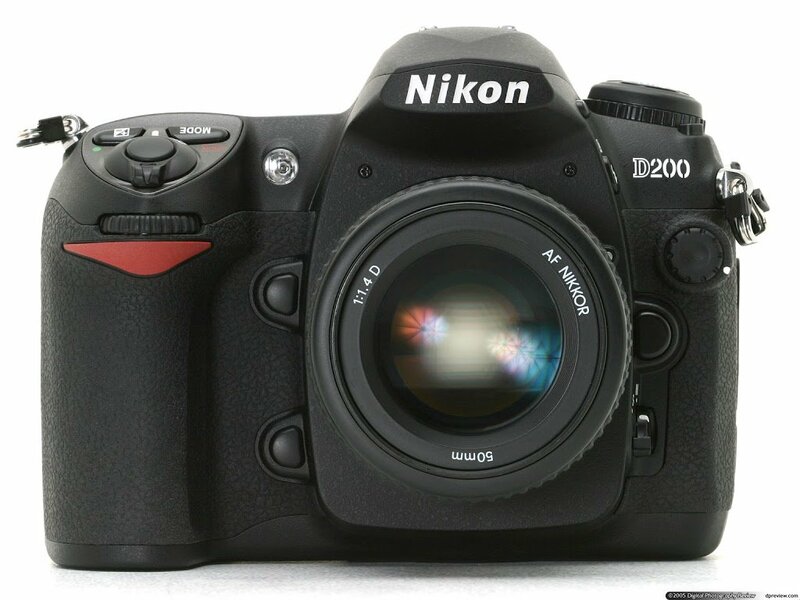 If anyone has tips on how to operate this camera- especially for food photography! -tips are so welcome! Leave a comment or e-mail me at aducksoven@gmail.com. Who’s gearing up for a weekend of bowl games? Honestly, I’ve hardly even thought about New Years Eve because I’m just trying to soak up the last bit of football before I have to spend another spring and summer waiting for this magical time to roll around again. I’ll be sharing some new football concoctions with you Tuesday, but here are a few excellent staples. Salmon Dip. I make this for just about every occasion I can find an excuse to nowadays. Pulled Pork. Need I say more? Bleu Cheese Stuffed Burgers. 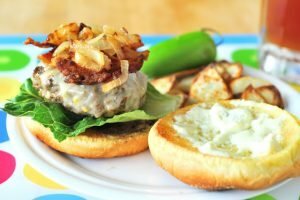 My absolute favorite way to eat burgers is with lots of bleu cheese and caramelized onions, and here’s how I do it. Teriyaki Chicken Legs. These babies continue to knock my socks off and they’re one of the more memorable things I’ve made for football parties. This recipe comes from my mom, like all good recipes do. Happy bowl season! And, er, New Year and all that stuff!